Del-Air offers a complete line of heat pumps, which can both heat and cool your home. They range from 10.0 to 17.90 SEER (Seasonal Energy Efficiency Ratio), a measure of cooling efficiency for air conditioners and heat pumps. The higher the SEER number, the more efficient the heat pump system is. We offer a full range of heat pumps with various SEER ratings and price points that will provide efficient, year-round comfort for you and your family. Need Your Heat Pump Replaced? Del-Air can service or install the perfect heat pump for your home, or provide you with a residential heat pump price estimate. Are you looking for a specific brand? Our installation and service professionals will offer you every choice and take care of your every need. Simply fill out the form to the right or give us a call and we’ll get you a quote on a heat pump right away. 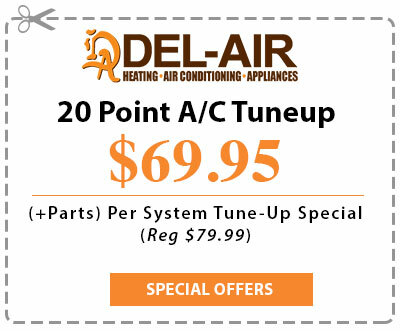 Del-Air provides free estimates, full installation, repair, and ongoing maintenance. Ask how our new range of heat pumps can make your home more energy efficient and save you money on utility bills. Del-Air knows how to manage the harsh Florida climate by cleaning and repairing your heating and air conditioning system correctly. We strive to put homeowners at ease, letting them know that one call provides access to fast, professional, and friendly service at affordable prices. Del-Air offers 24-hour Florida emergency heating repair, taking care of all of your heating service and repair needs on any brand of heating unit. Del-Air is proud to provide you with the most reliable, professional and budget-friendly heating service in Florida. When choosing a Florida heating and air sales, service, or installation company, it is not only important that they are EPA certified; it is the law. If your current heating company is not EPA certified, you may be risking more harm to your heating system than good, which will cost you more money in the future. At Del-Air, we are EPA certified and properly licensed and insured. You can rest assured that when you call on us for Florida heating and air sales and service, you will always get a qualified and trained professional to handle all of your HVAC needs! Start Saving On Your Electric Bill Now! Heating services in Florida are in demand during specific times throughout the year. Florida’s weather is known for its extreme fluctuations, and the cycle demand of our heating and Florida air conditioners is long. Therefore, it’s important to have the right HVAC system. If you live in the Florida area and you have an older central heating system, consider upgrading to a high-efficiency heating and air conditioning system to cut down on your electrical bills.